Today, Britney is here from J&M’s Eye Candy. There are some gorgeous things in here Etsy shop. Definitely worth checking out. I love the red, white and blue head band! And her blog… Oh goodness. Red, white and blue dipped strawberries, kid’s crafts, home decor, fashion and so much more. Check it out, but first Britney’s going to share a great way to add some flair to a sundress (or any little girl outfit). Hi there! 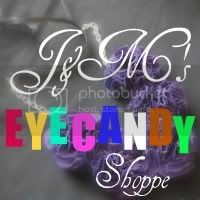 Britney here from J&M’s Eye Candy Blog and Shoppe! My SIL Kristine and I created our blog as a place where we can collectively archive our projects and share it with others like you. We have a good time over there, and would love to have you come visit. When not writing blogs, reading blogs or creating, I am a momma to two little monkeys, J and P.
I am super excited (and a little nervous) about guest blogging for someone as cool as While He was Napping! Thanks for having us! Today I wanted to share a quick and easy way to dress up a boring sundress. I bought turquoise, purple and white felt. I cut out circles in each color. I used the end of a glass, the top of a honey bottle and a spool of thread to trace my circles, but since that doesn’t help you at all, my big circles were 2 1/2 inces, medium circles were 1 3/4 inches, and my little circles were approx 1 inch. Place the circles on the dress randomly, and layered. Before I sewed the circles on I took a lighter and fringed the edges. It kind of seals the edges, and makes the circles kind of turn in. Now just sew them on. I am not a sewer by any means, so this is not a fancy job at all. I just used a needle and thread and did like a star looking stitch. Super easy, even for me. What an adorable little girl. And how easy was that touch of flair! That little sun dress is amazing. This is so going in my “When I have a girl” file. Thanks so much for sharing Britney! It was a pleasure to have you. 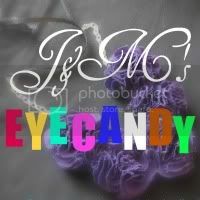 Now, go check out J&M’s Blog and make sure to visit their cute shop too!